BCAA’S (Leucine, Isoleucine, Valine) Muscles breakdown BCAAs while training and Mammoth BCAA provides you with an extremely high dose of this to offset this breakdown. High dosed BCAA’s have been shown to accelerate recovery, spare any muscle loss, and help ensure no delayed onset muscular soreness. This amino acid is essential for recovery and the successful transport of other amino acids, electrolytes, and nutrients across the intestinal barrier. When hydration is a premium during training glutamine helps ensure nutrients carried in water get absorbed properly. This osmolyte has been proven to assist in endurance performance by maintaining proper water balance and neurotransmission in working muscles. It has also been shown to assist electrolytes in and out of the muscle while training as well and is an essential component to the Mammoth BCAA formula. 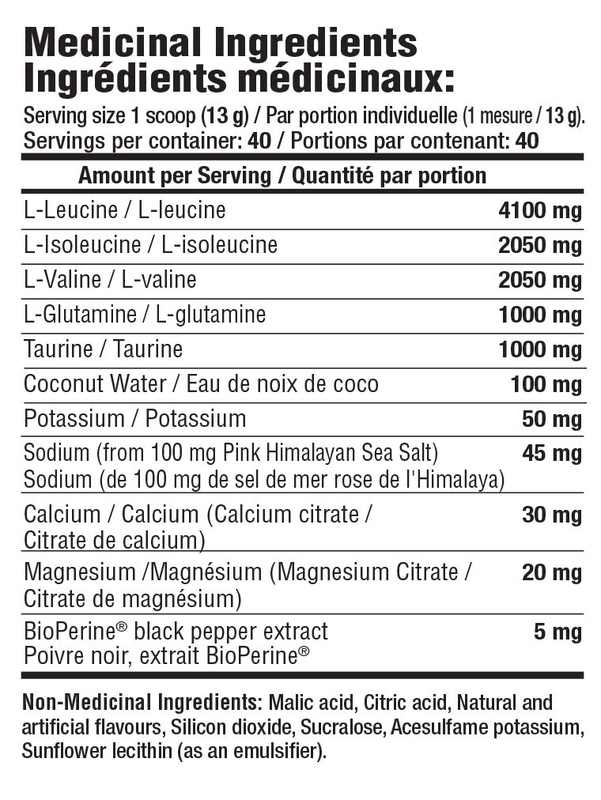 There is no better complete and natural electrolyte source than coconut water extract. We included it because it’s excellent for quick re-hydration and healthy maintenance of body fluid and electrolyte balance. When you sweat one of the major electrolytes lost is sodium. 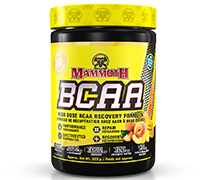 This critical electrolyte found in it’s natural form is an essential component of Mammoth BCAA formula to provide you with the form of high quality sodium to keep you training harder for longer. When it comes to ensuring mineral and amino transport, Bioperine is the best insurance policy you can include in any formulation. Mammoth BCAA didn’t spare any expense when it comes to making sure all the amino acids and critical electrolytes get absorbed rapidly. No Artificial Colours or Dyes! (8-16 fl oz / 236-472 ml) of liquid (water, juices etc.) during or immediately after exercise. Can also be used throughout the day for basic hydration and better recovery.